After spending July in England I was ready for a Fakahatchee fix. So still jet-lagged I headed to the swamp, stopping first at Big Cypress Bend Boardwalk to see how our new signs were faring. Donning my Fakahatchee cap and in a matching shirt, I was an obvious target as I stepped out of my SUV and was quickly waylaid by a charming French couple and their ten year old daughter. They asked if the Indian Village was worth visiting. Hmm – a common misconception that our new entrance will address. They had pulled over to picnic and complained they had just been on an airboat tour and not seen a single gator. They quoted their guide, “with so little water gators are hard to find.” This was August. When I left the rainy season was in full swing. What was up? I ended up giving our French guests an extended tour, but sure enough there wasn’t any water until the gator hole, except for the small pond in the root hollow created by a toppled tree. Nevertheless they were delighted. I was able to point out a well camouflaged 6 ft female alligator with half a dozen hatchlings in the borrow ditch. The hatchlings were the smallest I’d ever seen and couldn’t have been more than a day old. After that a barred owl obligingly flew in and roosted not 10 ft from us and a six lined skink let us get close–up and personal. Their day was made. The new signs were holding up well by the way. My next stop was to check out Six-pipe slough on Janes Scenic Drive. Instead of water gushing through the culvert, there was barely as much water as we had for our winter swamp walks. If rain didn’t come to the Fakahatchee soon, and lots of it, the season ahead looked tough. It was then that I spied the marbled-green fruit of a pond, aka custard apple. Pond apples, (Annona glabra) with their cherry-like bark, big glossy leaves and buttressed trunks are one of my favorite trees. They bear the largest fruit of any of our natives and its light wood was used by Calusa and later Native Americans to make fishing floats. The pond apple also happens to be the larval food of the giant sphinx moth; the pollinator of the ghost orchid. Although the vast majority of our ghosts are found on pop ash trees, about 15% utilise pond apples. Ripe pond apple fruit has poisonous seeds, mild yellow flesh, and is an important wildlife food. 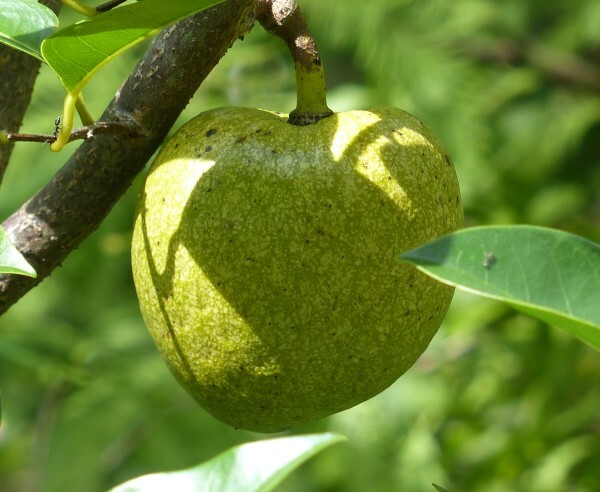 Although sometimes called alligator apple, it’s more commonly consumed by turtles, birds, raccoons and squirrels. The creamy yellow flower of the pond apple with petals and sepals in 3s. I collected a fallen fruit and sliced a wedge out with my knife, being careful to avoid the poisonous seeds and took a bite. Not quite ripe – the flesh hadn’t yet turned yellow. Perhaps a passing vehicle had detached this one prematurely. Its taste was not unpleasant, although a bit insipid with just a hint of passion fruit. But it’s an important wildlife food, hence one of its other aliases alligator apple, although more commonly it’s consumed by turtles, birds, raccoons and squirrels. 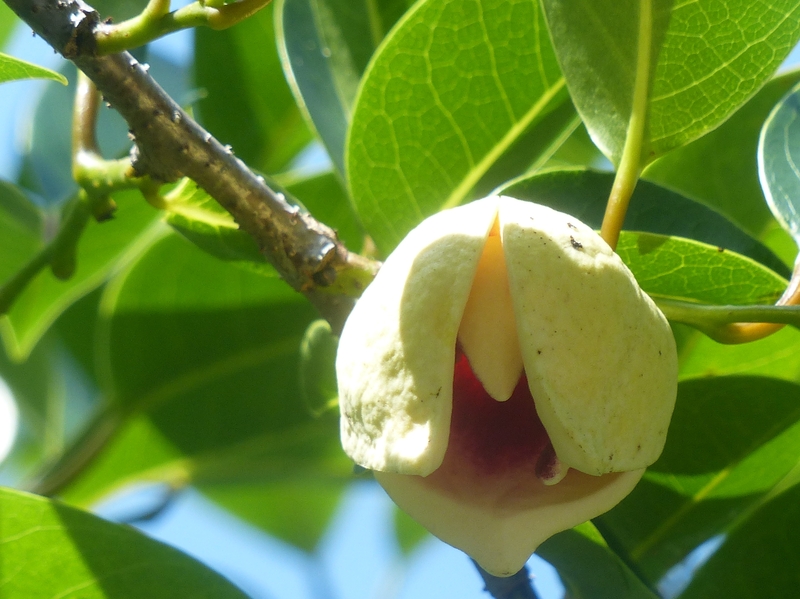 Pond apple trees were once much more common in Florida. Patrick D. Smith, in his A Land Remembered, paints a portrait of a vast bygone pond apple forest that grew along the southern shores of Lake Okeechobee, swarming with moon vine, airplants and Carolina parakeets that has since been destroyed by drainage dikes to make way for sugarcane and other agriculture. Like most of our tropicals, the pond apple is at the northernmost limit of its range. They naturally occur on both sides of the Atlantic aided by their buoyant fruit and range from South Florida through the West Indies, to South American and West Africa. 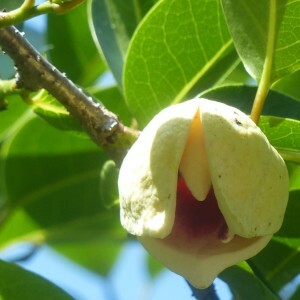 Due to its hardiness and tolerance of brackish conditions A. glabra has been used as a rootstock to graft some of its more desirable cousins, such as soursop (A. muricata) and sugar apple (A. squamosa). What’s one man fruit is another man’s poison. In Australia escapees from this process have become highly invasive, especially in the wet tropics of northern Queensland where ironically, or maybe in a case of poetic justice, the invasive pond apple threatens their melaleuca wetlands, as well as some native mangrove communities. The Friends of Fakahatchee’s Captain Franklins Adams remembers a large pond apple swamp along Janes Scenic Drive in the late 1950’s and early 60’s when the Fakahatchee was still a State of Florida Wildlife Management Area run by the old Game & Freshwater Fish Commission. Franklin has been back a number of times to try and find the pond apple swamp’s remains but there’s no trace of it. For now we’ll have to be content with a scattering of trees along our trams and Janes Scenic Drive and the population deep in the swamp.